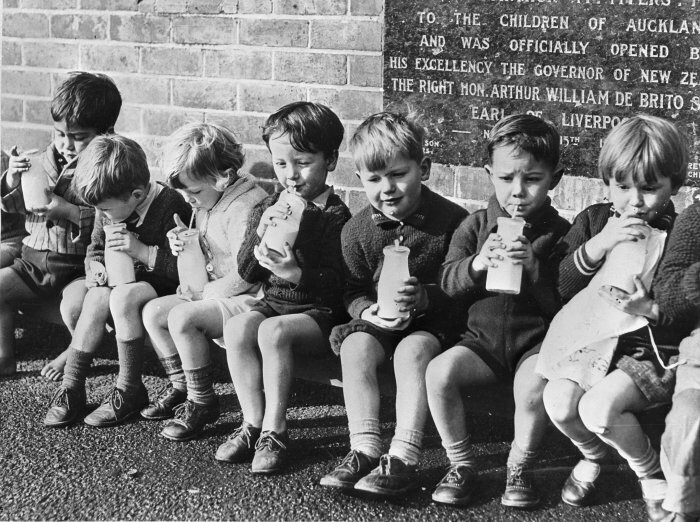 Home > Social Issues, The Body Politic	> Can we afford to have “a chat on food in schools”? McKinlay was 100% on the mark when he said spending on children should not be considered as a social cost but as an economic investment for the future of the country. We have lost our moral compass when we demand tax cuts ahead of good policies that benefit our children. The situation is so dire for many families that their households are often empty of food. After rent, power, and other fixed costs are taken out of their meagre incomes, there is simply not much left for discretionary spending on things like food, medication, clothing, etc. To those who care enough, I encourage you to read “Burnt out Teacher’s” full blogpost. It makes for sobering reading. “ We need solutions that recognise the many complex causes of child hunger and poverty if we are to use the limited resources we have to make a real difference to children’s education and health outcomes. Dr Wills may or may not realise that by issuing the statement that “fully state-funded school cafeterias… tend to provide poor food, assume state responsibility for a parent’s role, create dependence…” – he is perpetuating several unhealthy prejudices which the politically rightwing and conservative religious groups use to oppose food in schools for children. Hopefully it is a mere coincidence that Dr Wills’ comments seem to mirror the extremist views of “Family First”. 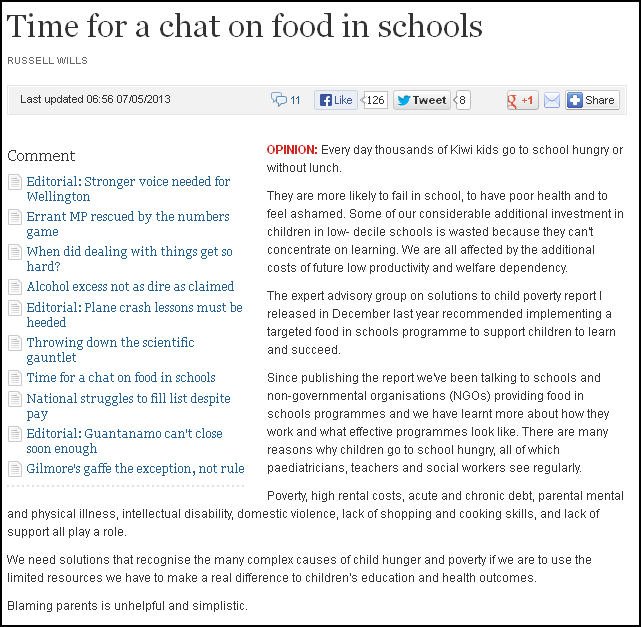 Where Dr Wills’ op-ed piece falls down is his proposals for how to provide food in schools. Dr Wills proposed that schools be responsible for growing their own food, and to operate in partnerships with businesses. He promoted philanthropy rather than state intervention. I asked for feedback from the principals of two low decile schools, and from Bryan Bruce, documentary-maker, child poverty campaigner, and producer of the documentary, “Inside Child Poverty“, on Dr Wills’ proposals. I first asked all three; having read Dr Wills’ op-ed piece, “Time for a chat on food in schools”, what was their overall view on the points he had made? I then asked, is this practical practical in the short term? Long term? Would gardening, harvesting veges, cooking and serving the food be more time consuming than the provision of fully state-funded school meals? Where would vegetables be cooked? “I believe it would be [more time consuming than the provision of fully state-funded school meals]. Is a Public Private Partnership a desirable proposal? Or reliance on a a current ideological fad? Does reliance on “teachers involve students in the growing, harvesting and preparation of the food” take students away from an already packed curriculum and place more demands on teachers and other staff? “We seem to be going back to the 19th Century idea of relying on charities and volunteers to look after the poor. Haven’t we learned anything ? ” However, I think there could be two potential roles for government funding. First, there is a place for a co-ordination role to bring together schools and businesses, and manage the programme and the workload for principals and business owners. Second, there is an argument to match government funding to philanthropy on a sliding scale. For example, $3 for every $1 raised in a decile 1 school, decreasing for better-off schools. Dr Wills appears to be promoting a State/Philantropy Partnership policy. Is this a practical means by which to promote food in schools, or is it an abrogation of duties which should be the State’s responsibility on this issue? What happens where businesses or private philantropy is not forthcoming – especially in poorer areas with high unemployment and few businesses? 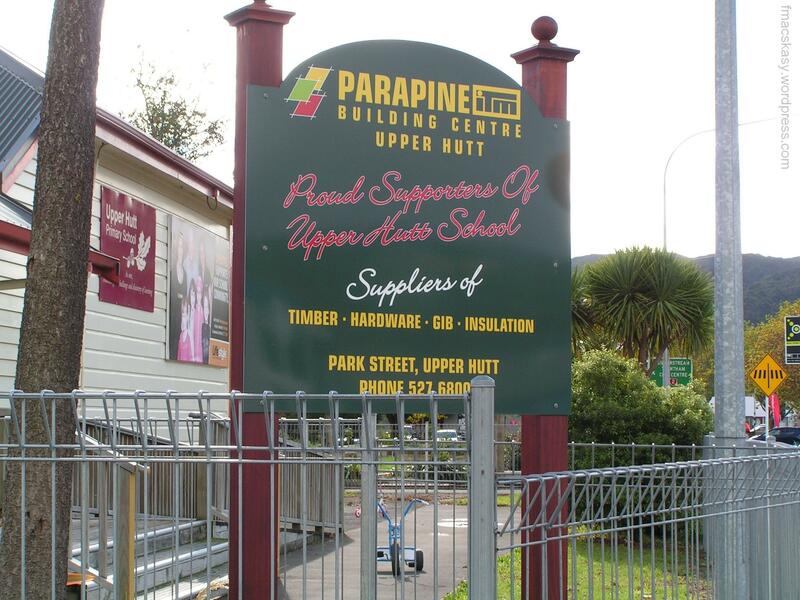 And would private businesses expect a quid pro quo, ie, advertising on school grounds? Is this a viable, necessary step? Or a case of “talking heads around a table” whilst the problem of hungry children goes unaddressed? Ruth also offered her thoughts on matters arising from Dr Wills’ ideas. Questons such as; who cares and tends to the gardens during school holidays? Are school staff expected to tend to garden plots during holidays? What about schools that have little or no spare land for gardens? And of course the also-obvious question which I put to Ruth – what do children eat whilst crops are growing? This blogger concurs with Bryan, Ruth, and Mike; Dr Wills has suggested some positive ideas – but the prospect of turning our schools into vast agricultural plots to feed hungry child is simply not practical. Children go to school, first and foremost, to learn. Those children from low-income or impoverished families should not be made to become mini-farmers. Teachers go to school, first and foremost, to teach. They do not expect to add Farm Manager to their C.V.
Child poverty is here, in our country. Whilst right wing conservatives ‘tut-tut’ and wag their judgemental fingers at the problem (I refuse point-blank to call it an “issue”), children through no fault of their own are going hungry and their learning experience is diminished. As a nation, it is almost as if we have embarked on a deliberate course of increasing poverty and ensuring the advent of the next generation of impoverished New Zealanders. If that is our aim, then we are exceeding all expectations. The UNICEF report referred to above proves that poverty is a growth industry in this country. The time for “chat” is over. The Mana Party in Parliament has a Bill before the House. The bill is designed to fund nutritional breakfasts and lunches to all their students in decile 1 and 2 schools. Feeding the kids should be our first priority as a nation. The Bill aims to set up government funded breakfast and lunch programmes in all decile 1-2 schools. It’s a simple, easy and immediate way to address growing levels of child poverty in Aotearoa and has been a key recommendation of leading organisations such as the Children’s Commissioner’s Expert Advisory Group on Solutions to Child Poverty. The Bill is expected to come before Parliament for its first reading on Wednesday 5 June. So far Labour, Greens, Maori Party, NZ First, and Independent MP Brendan Horan have agreed to support it. We need one more vote to get it passed and to a select committee for further consideration. That’s all it will take. You’re 7 years old. It’s winter. You haven’t had breakfast and you’re hungry. What do you want to hear? We can’t change tomorrow if we don’t do the right thing today. My name is…………. I live in your electorate . I urge you to commit to cross- party talks on how to end Child Poverty in New Zealand. Please begin by agreeing to Cross-Party discussions on how we can implement a policy of supplying healthy meals in schools and show good faith by supporting the Feed The Kids Bill as a first step. Please support the Feed the Kids Bill. Nothing is as important as ensuring that all children have a decent chance in life. Please support the Feed the Kids Bill. This is so important to me that I’ll be basing my vote at the next election for those candidates/parties who support this Bill. OK, let’s get some things straight about providing free healthy meals in schools. 1. First of all let’s decide on the principle before arguing about the detail. Let’s admit there is a significant problem of children turning up to school hungry and that a lot of kids are eating low cost foods that contain a lot of sugar and fat , causing obesity , diabetes and long term health problems. And at least get the Feed The Kids Bill to Parliamentary Select Committee. You can argue all you want about how it should be funded or what’s going to be on the menu there. If you don’t think we have a community responsibility to feed children and/or educate their palates to healthy eating habits – then read no further it will only make you angry. 2. It doesn’t fill a hungry kids tummy to point at their parents and shout “Your problem is you have bad parents”. This page takes the view that kids don’t get to choose their parents and we have a community responsibility to ALL our kids to make sure they grow up healthy. And if that means feeding them for free- then that’s what we do. 3. No one is going to force feed any child food they don’t want to eat or is culturally inappropriate. If you watch the video below which I filmed in Sweden for the documentary you will see children from multi -cultural backgrounds CHOOSING their food. And Yes children with allergies are catered for and Yes children can still bring their own lunch prepared by the parents . 4.Free healthy school meals can be paid for without raising taxes. We just choose to re-distribute the existing pool of tax payer money and give up on some other things. Here are some suggestions, I’m sure you can think of other ways we could spend smarter. (a) We could fund school meals out of the Health vote rather than the Education vote. In a document released under the Official Information Act I revealed that children under 14 receive 10% of the money set aside for health care. But children under 14 represent 20% of our population. So we could fund some of it – if not all of it – by giving kids their fair share. (b )It is a well accepted health statistic that for every $1 we spend on preventing disease we save $4 in expensive hospital cure. So within a few years the scheme will fund itself out of what we save. If we DON’T do it, taxpayers will be spending much more than they are now on the Health budget in the future. (c) We could make children a spending priority. National plans to spend a billion a year on Roads of National Significance over the next 10 years. What about Children? – aren’t they of National Significance? I’d much rather feed our kids than be able to by – pass small towns while driving to Auckland . (d) We could pay the pension to people when they actually stop working and not just because they reach 65. (e) We could spend more energy making sure people paid their taxes . Last year the IRD detected about a Billion dollars worth of tax evasion mostly by businesses. It’s estimated that the real tax evasion in NZ is between 4 and 5 Billion. If you pay PAYE you can’t cheat your taxes. So we could easily pay for free school meals if more adults played fair. Let’s impose greater penalties for tax evasion, and let’s stop thinking of tax as a bad thing. Tax is a good thing – it’s giving to ourselves. That’s how we can have schools and hospitals and yes even Roads Of National significance. Tax is the price of civilisation. Get over it. Now whether you agree with some of the above, all of the above or none of the above , let’s at least agree that The Feed The Kids Bill should at least go to Select Committee after its First Reading so the issue can be properly debated. Please contact your local MP today and urge them to support the Feed The Kids Bill. 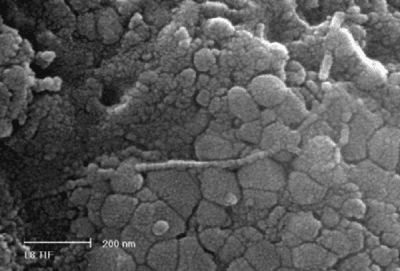 This blogpost was first published on The Daily Blog on 10 May 2013. My sincerest appreciation and thanks go to Bryan Bruce, Mike Fackney, and Ruth O’Neill for taking time out of their busy schedules to respond to my questions. I dispute the need to employ people who can cook food on a large scale. Volunteers could absolutely do this with a bit of instruction (eg you need to plan better and allow additional time for heating due to the volume). Our maraes have welcomed people through food (large volume) and prisoners cook for large groups of their peers every day. Same is true for some boarding schools although the one I attended only had students doing this at breakfast. Question is, K, is it fair to rely on volunteers? Especially if parents are at work, or solo-parents are at home looking after smaller children. Plus, how long do we rely on volunteers? After a while, people burnt out. My experience with volunteers is that, usually, it falls upon a small minority who do the hard yards. The rest either do nothing, or, a small minority complain that the working volunteers aren’t doing it right. Children’s Commissioner, Dr Russell Wills believes we should have a “chat” about food in schools. I hope he’ll be going hungry during this conversation taking place. Trouble is, K, that “volunteers” can be another name for unpaid labour. How long can you exploit peoples’ good will? And why should we when there are thousands of people out of work looking for jobs. If they can do it Europe there’s no reason why we can’t do it here in New Zealand. I refuse to believe it’s difficult at all. It is obscene that kids are going hungry in a land of plenty!!! I simply cannot believe that this is where we have ended up as a nation and a society. Shame, shame, shame on us!! !